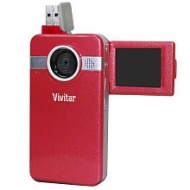 alaTest has collected and analyzed 10 reviews of Vivitar DVR 410 Digital Video Recorder. The average rating for this product is 1.7/5, compared to an average rating of 4.0/5 for other Camcorders for all reviews. Reviewers really like the price. Some have doubts about the durability and zoom. We analyzed user and expert ratings, product age and more factors. Compared to other Camcorders the Vivitar DVR 410 Digital Video Recorder is awarded an overall alaScore™ of 65/100 = Good quality. i got this poor did not work DO NOT BUY!!!!!!!!!!!!!!!!!!!!!!!!!!!!!!! you get what you pay for"
Our son had it for 2 days and the power button broke on it. Then we could not find a fair replacement for our Autistic child. Not so great, but the price is. The recorder kept turning off. My son did not like it. He used it one time and that was all. this is just like a toddler's toy. difficult to set off the beep.